Is gmail-to-gmail still insecure? Why? I have always heard that email is an insecure method of communication; I assume this has something to do with the email protocol itself. But when sending an email from one gmail account to another, Google has complete control over how the email is transmitted, and Google seems decently concerned about information security. So it seems that they could, if they wanted, turn gmail-to-gmail messages into a secure communication channel, and that this would probably be in their best interest. So have they done this? If not, why not? Is gmail-to-gmail communication still insecure (for the purpose of, say, sending a credit card or social security number to a trusted recipient)? If you can trust everything to go right, then gmail-to-gmail is perfectly secure. But you can't always expect everything to go right. For these reasons, the security and privacy community long ago reached the stance that only end-to-end email encryption is secure. That means the email remains encrypted on server disks and is decrypted when you're reading it, and never stored decrypted. There have been an enormous number of comments, so let me expand/clarify a few things. End-to-end encryption - in the context of email, when I say end-to-end encryption I mean something like PGP, where the message is encrypted until it reaches the recipient's email client, and only decrypted to be read. Yes, this means it can't be searched on the server, and often also means it doesn't remain "backed up" on the server either. This is a case where security and functionality are at odds; pick one. Forget about credit card data, there are people trying to communicate with email whose lives, and the lives of their families, depend upon the security of the email. So as there are phrases in the comments below like "depends upon what your standards are for 'secure'", "sufficiently motivated adversary", "there is an illusion of security at the email-level" - am I being too strong to say the server can't be trusted? Not for people whose lives are at stake. That's why the phrase "email is insecure" has been the mantra of the privacy movement for 20 years. Trusting the server - In the US, "your cap for liability for unauthorized charges on a credit card is $50" so you may well be happy trusting the server with your credit card. If you're cheating, on the other hand, you might lose a lot more as the result of leaving unencrypted email on the server. And will your service provider shut their doors to protect your privacy? Probably not. STARTTLS is almost always "opportunistic", meaning that if the client asks and the server supports it, they'll encrypt; if either of those things are not true, the email will quietly go through unencrypted. Self-signed, expired, and otherwise bogus certificates are generally accepted by email senders, so STARTTLS provides confidentiality but almost none of the authentication. It's relatively trivial to Man-In-The-Middle email if you can get in between servers on the network. A lot of this hinges on what you mean by "insecure". Traditionally e-mail was considered an insecure transport as it was transferred over an unencrypted protocol (SMTP) and typically you had limited control over how the e-mail actually reached it's destination, so you wouldn't necessarily know about the security of the systems that it traversed. These days most modern large e-mail providers use encrypted transfer protocols (generally SMTP + SSL) which removes the concern about the e-mail being sent over the Internet in the clear, however for generally Internet e-mail the concern about not knowing what systems will process the mail on the way to it's destination remains. In your case you would seem to know that as it'll be google sending and receiving, so it's not likely to leave their control. A couple of potential concerns remain. do you trust Google? Presumably you do as you're using their mail service, but it goes without saying that they could theoretically get access to your mail. Security of the mail once it reaches it's destination. You may not have control over how the recipient stores/processes the mail and that could result in it being held insecurely (e.g. being downloaded to an unencrypted mobile client, stored on an unencrypted PC etc). Also e-mails tend to get forwarded on, so there's always the risk that someone sends it to another party who's not hosted on google. If you're satisfied in both those regards then generally yep I'd say there's nothing wrong with using e-mail for general data transfer. The one other point I'd mention is that specifically for things like Credit card data, if you're a business you'll have compliance concerns (e.g. PCI) and they may well preclude the use of e-mail. 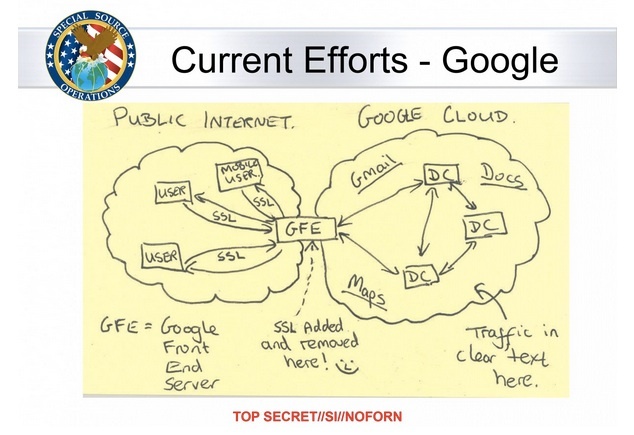 In the Snowden revelations it showed that the NSA had tapped into the fibre cables connecting Google's datacenters together. You can refer to the image below and make your own deductions about whether anything on Google's network is actually secure. They may have improved the situation since then, but it would be hard to prove to customers exactly what they've done to improve security on their network and that the government no longer have full access. You would have to take their word for it. If you want real security you should use open source end-to-end encryption where only the sender and receiver have the private keys and all encryption/decryption is done client side. There are a number of new webmail services around for this or you can always use the classic GnuPG. In addition to the other excellent answers, there is one more concern: just because the sender and the final destination are both on gmail does not mean that the email remains within Google. If the recipient uses his own domain name, it is entirely possible that he routes his emails through an external server before feeding it back into Google. Gmail may detect this and directly deliver the email, or it may follow the MX record to the external server before sending the email back into Google. All the other answers are concerned with someone reading your e-mail. However, that isn't the only concern - you also care about the identity of the sender. And that's another great weakness of e-mail - by default, there is no way to verify the identity. The sender is the one who supplies the "From" address, and I can easily send e-mails "from" bill.gates@microsoft.com. You have no way of knowing if I'm really Bill Gates. Many e-mail clients will also allow you to both sign and encrypt the e-mail, which ensures both the identity and the safety of contents. Of course, you need to know you can trust that given certificate in advance, and you need the proper key to decrypt the e-mail. It's especially useful for e.g. companies, which can have root certificates that are trusted, so any child certificates are implicitly trusted as well. However, even if you only have the e-mail to go on, it's rather easy to ensure the safe exchange of keys - it just requires a few e-mails back and forth (though there's still ways to break this with MITM). "So it seems that they (Google) could, if they wanted, turn gmail-to-gmail messages into a secure communication channel, and that this would probably be in their best interest." No doubt Google "could" turn Gmail into one of the most secure email services around. They clearly have the resources. But to answer the OP's question -- No, this would NOT be in their best interest!!!!! Remember, their business model is to provide all sorts of internet services free of charge to the end user. They make their money by collecting the end user's data (email content, GPS location, search queries, etc.) to develop a profile that they can sell to advertisers. This means your business is literally Google's business. Google will ALWAYS be looking through your stuff, they will always store your stuff, and they will always be giving it to 3rd parties. They have to. Its how they pay the bills. Moreover, since Google maintains the key to any encrypted information they can and will turn it over if subpoenaed by the government or even private parties. This is not the case for services that "throw away" the encryption key. If you require security look for companies that don't profit from your personal information. If you feel the need to distribute your financial information electronically then why not use services that are designed for security (e.g. proton mail) Wickr, or even iMessage (they throw away the encryption key). Also, break up the numbers into separate messages so an unintended reader can not easily recognize it is as a CC number. Is it secure to send sensitive data through gmail smtp with nodemailer? Sent Rental Application Via Email with No Response… Is My Information in Jeopardy? How can I mitigate scam comments on my YouTube videos? Is e-mailing personal information significantly riskier than transmitting the same information another way? Credit department is asking me to email them a color copy of my US social security card - how unsafe is this?